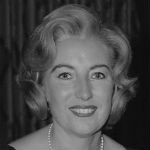 Vera Lynn (born 20 March 1917), is an English singer, songwriter, and actress whose musical recordings and performances were enormously popular during the Second World War. During the war she toured Egypt, India, and Burma, giving outdoor concerts for the troops. The songs most associated with her are “We’ll Meet Again”, “The White Cliffs of Dover”, “A Nightingale Sang in Berkeley Square” and “There’ll Always Be an England”. She remained popular after the war, appearing on radio and television in the UK and the United States and recording such hits as “Auf Wiedersehn Sweetheart” and her UK Number one single “My Son, My Son”. In 2009, at age 92, she became the oldest living artist to make it to No. 1 on the British album chart. She is best known for her 1939 recording of the popular song “We’ll Meet Again”, the nostalgic lyrics were very popular during the war and made the song one of its emblematic hits. In 1941, during the darkest days of the Second World War, Lynn began her own radio program, Sincerely Yours, sending messages to British troops serving abroad. She and her quartet performed songs most requested by the soldiers. Lynn also visited hospitals to interview new mothers and send personal messages to their husbands overseas.